Jasper was a very pretty kitten with a fluffy white coat and cute black feet. Plus he had the perfect little black nose, just like a button. But mummy cat had to watch her kitten all the time. Jasper is a very curious and adventurous little kitten. What will happen as he ventures into the garden, up on the roof, into the pipes and even on a bus! Follow his escapades and misadventures in this adorable and engaging children’s story by English author and fan of cat picture books, Ken Mackenzie. 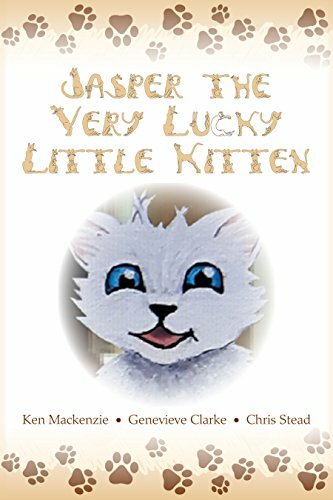 With many locations, an easy to remember refrain and a subtle message of love and safety this sweet cat story will delight children and grandchildren alike. It will also be loved by fans of cat story books for children such as Pete the Cat by Eric Litwin and White Cat Black Cat by Sigal Adler and grandchildren alike. This book also has a very special purpose, with 25% of the profits going to support the important work of the Children’s Hospice, South West, who provide hospice care for children with life-limiting conditions and their whole family across the South West of the UK.